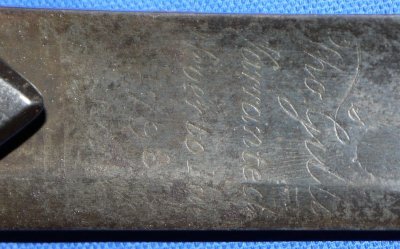 In overall good condition, a 1796P light cavalry officer's sabre, etched "Tho Gills Warranted Never to Fail 1798", with unusual etching design on the obverse. 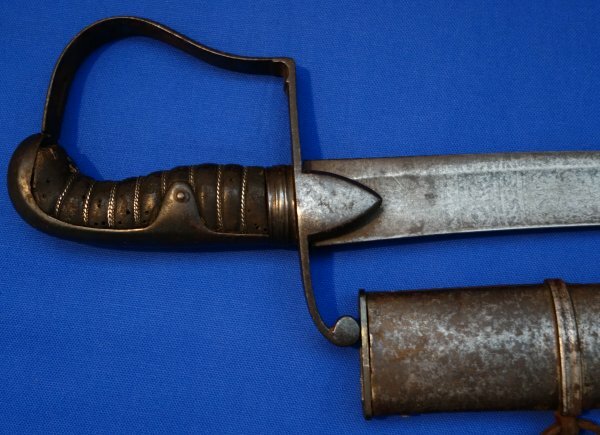 A good early example of the 1796P light cavalry sword with Gills' famous warranted never to fail statement etched to the blade, plus the date of 1798, so this is a very early Napoleonic sword. The etching on the other side of the Gills' mark has very unusual etching which we have not seen before; it may include the initials of the original owner (now too feint for us to determine). Some slight nicks to the cutting edge indicate it was used against someone rather than something (clashes of sabres resulting in greater / more incised nicks). The 32 1/2 inch blade is in aged though good condition, the etching now feint, and firm in the hilt. The hilt / guard in good though again aged overall condition. The leather is still there on the grip, as is most if not all of the twisted silver grip wire. There are worm holes to the grip (worms long gone and we have treated the holes just to be sure); no extra charge for these! 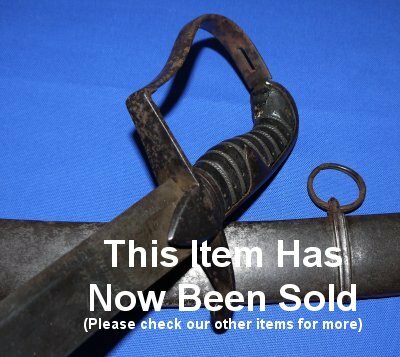 The officer weight steel scabbard is in good condition; the suspension rings may be later. The sabre sheathes and draws loosely, a clear sign the original internal wooden scabbard slats have long gone. Special because of the warranted statement, date and unusual etching. Well worth our price tag of £850. Please quote item reference L88 (1218). Further / full sized images available upon request.